YEP! gives you access to amazing discounts to all of Yellowstone's favorite activities and attractions. The areas best at an EPIC price! Join Geyser Whitewaterfor a rafting trip of your choice and then visit us, for unlimited zipline adventure in West Yellowstone. #1 Family Activity package! 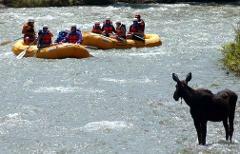 The time you select when reserving will be your rafting time. Stay and play as long as you like but this pass does not include come and go privileges throughout the day...It's the best deal going! Children 6-12 need to be with an adult on the course. Come and go throughout the day. Zip in the morning, go see Old Faithful and come back for an evening of adventure! However you decide to spend the day, fun is a guarantee..
$99 Adult $95 kids 6 to 12 Complete freedom and flexibility built into our Best Value! Come and go throughout any 3 days out of five! A Family favorite! $29 kids 4 to 7 The five element Junior Ranger Course is nearly 15 feet off the ground and offers high flying fun for the little ones. Recommended for children 4 to 7 years old. A adult may climb along for encouragement. Unlimited Fun! Unlimited Ziplines for up to two hours. New! 2 hour pass only $39 pp... Reservations required. Available at select times throughout the summer. Call with questions about your adventure 406.646.5171.